All new introductions from Whitchurch-based Hardy’s Cottage Garden Plants this year are from home-grown breeders and each plant has unusual and perhaps novel attributes. 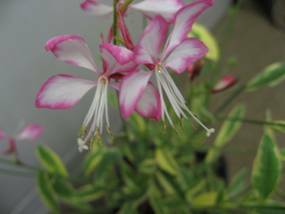 Bred by hardy’s this is a variegated form of Gaura “Rosy Jane” Originally a sport from the parent plant, which has been checked for stability over several years. The leaves are cream, green and purple variegated. It has the same picotee pink and white flowers as the parent and the same growing habits. This is an excellent new garden plant, ideal for borders or containers. Combine with grasses or mixed border perennials for impact. Another UK bred plant, Rosy Hardy named it following consultation with the breeder and Graham Spencer (Plants for Europe). This fabulous new Eryngium has yellow foliage and flower bracts followed by the blue flowers, giving it a wonderful colour contrast. This is a superb new border perennial or container grown plant. This beauty is from Fairweather’s nursery in the New Forest. 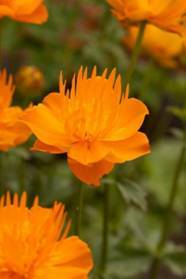 A very large flowered plant that is more floriflorous than other forms of Trollius. The orange flowers are prettily formed and up to 6cm in size. The amazing fringe of inner petals appear to glow in late spring sunlight.